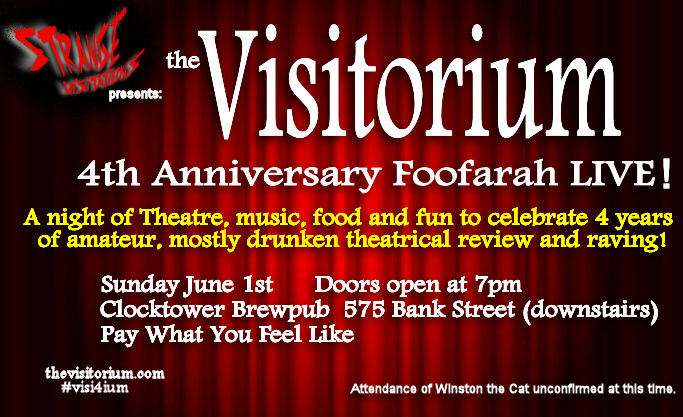 – Opening act, the newly assembled team of Foofarah Improv Players, merry folk one and all…Ryan Walsh, Kristine Shadid, Kevin Mongeon and Crush Improv’s own Brooke Cameron, and they’re gonna get the whole ball rolling around 730 or so (opening doors just before 7pm that night). I’ve seen all these cats do improv, and I’ve even DONE improv with some of them, and they’re the goods, trust me. – Madeleine Hall, recent Ottawa Theatre School graduate and star of their amazing production of SYLVIA, remounting her hilarious final semester solo performance piece! – May Can Theatre (Cory Thibert, Tony Adams and Mado Manseau), making merry and singing songs, before heading out on tour with their hit show WOLVES>BOYS. – Pretty Ugly Productions, aka Hannah Gibson-Fraser and Jodi Morden, giving us a sneak peek at their upcoming Fringe show, RACHEL & ZOE. Jodi and Hannah of Pretty Ugly Productions, Rachel and Zoe-ing it up. – Nick Fournier, aka Nick Wade, another OTS grad (kind of a running theme at this party) debuting some solo material following his recent appearance in Vacant House theatre’s terrific THE ANGER IN ERNEST AND ERNESTINE! – Loose Cannons Collective, a new team featuring even more OTS gangsters, performing a snippet from their upcoming Fringe show GETTING THROUGH, written by Aidan Dewhirst and featuring Alexa Higgins and Phil Merriman. – Nancy Kenny, just about to head out on an epic cross-Canada tour of her hit show ROLLER DERBY SAVED MY SOUL, and filming a feature length documentary at the same time, will be debuting some all-new material at the party! Nancy in ROLLER DERBY SAVED MY SOUL.pic by Richard Gilmore. – Tony Adams (of May Can Theatre) and Tess McManus (of Little Green Hat, about to debut her latest show TALES SHE TELLS at the Fringe) join forces for a show that, they promise me, WILL get messy. -And, finally, me. Kevin Reid, OTS orphan and theatre nerd, will be performing not one but two short pieces, both inspired by my time at the school. A reprise of my first semester piece THE FLOWER, and the premiere of what would have been my second. You gotta admit, that’s a lot of entertainment, folks. And how much would you expect o pay for this avalanche of amazing? How about nothing? Does that suit you? Good, because its settled…there will be zero charge for this anniversary party, just a small donation jar set aside to help yours truly buy well-deserved drinks for his performers and helpers. And half-price appetizers will be in effect throughout, so eat to your heart’s content! When the show’s over (whenever that is…I really haven’t planned this too expertly), the music will flow courtesy of DJ My Laptop, so stick around for some shenanigans. And if you’re a Fringe artist attending the festivities, you are encouraged to bring your promo materials along and flyer away…’tis the season, after all! Let’s make this evening about one thing and one thing only…the love of theatre. Darn, I forgot about the half-priced appetizer deal! Although I have to say, I hope the Visitorium doesn’t last another four years… hold on, I have good reason. You are one HELL of a performer and the world will be SERIOUSLY deprived if you’re not doing THAT full time in four years time. Holy smokes wow. We’re all lucky to have you around in the community, supporting theater and now making it. Here’s to the four year foofarah and its excellent emcee! So many thanks for making it out, and for being such a supporter for so long, Caitlin! 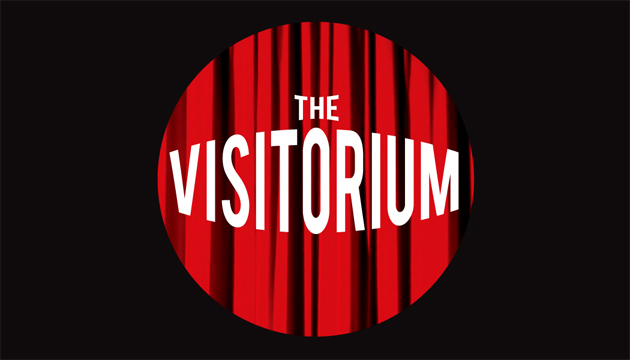 I think the Visitorium will stick around, but hopefully shift focus before too long. But I liked that solo performing WAAAY too much to just stick to bloggery from here on out. Stay tuned!